Left-wing students, activists meet Mahmoud Abbas at PA HQ to push for Palestinian state. But some questions left unanswered. A rare meeting between hundreds of Israeli left-wing student activists and Palestinian Authority President Mahmoud Abbas took place Sunday. The event was jointly organized by MK Hilik Bar (Labor) and the One Voice association, with the aim of promoting a "Two-State Solution" which would see a Palestinian Authority-ruled Arab state in Judea and Samaria. 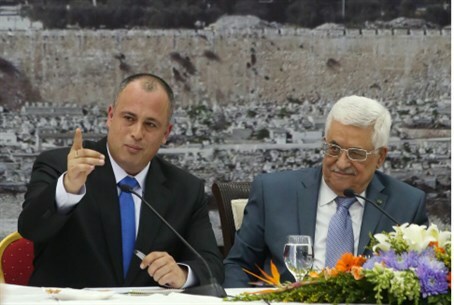 Arutz Sheva Managing Editor Ari Soffer was at the Muqata for Abbas' speech, which covered a number of issues - including a call to the audience to "stop the settlers". The event was meant to give an opportunity for dialogue, but carefully-vetted questioners only skirted key issues, with Abbas taking the opportunity to promote his position on the ongoing, US-brokered negotiations. Questioners and organizers alike praised Abbas and the PA, and were critical of their own government. Among several slightly stranger points in the event, MK Bar noted that both he and Abbas were born in the Israeli city of Tzfat, and expressed his hope that one day the PA chief could visit "as a tourist". Abbas also insisted that the Islamist terrorist group Hamas had "renounced extremism", and that Israel could rest assured it would abide by any final status agreement despite not being included in the talks. Clearly no one had informed Hamas' leadership of their change of position, however, as the group came out swinging, condemning the PA head for promoting "normalization" with Israel by meeting students, and calling for an immediate end to talks.